If you’re a smart person working in a technically challenging role, and you work in an organisation full of smart people doing technically challenging roles, then having a high level of cognitive intelligence, will be just a normal state of affairs. IQ then becomes a “threshold ability”, without which you can’t even get a place in the team. Those in organisations’ top quartiles for technical calibre secure jobs based on their expertise, technical ability, accuracy, correctness and smarts. Let’s define EI as the ability to flex our own reactions, emotions and behaviours according to the situation, and in response to those around us, while still remaining 100% ourselves. This requires, of course, a heightened ability to recognise, respect and then respond to others around us. Those with high EI will be able to read people and situations well and with positive intention, to ensure they don’t give a one size fits all approach. Step 3: Have the ability to flex what we’re doing and how we’re doing it, in response to that awareness. And here’s the tricky part. In the world of science, technology, engineering and maths, we are judged across our education and career, by our accuracy. Are we right? Are we wrong? Did the calculation work? Did the work progress? Am I a good (or great) chemist, biologist, mathematician, engineer, whatever speciality I work in. As we step up into leading people, none of that works in isolation anymore. The uniqueness of every scenario, of every human, of every set of values and behaviours, means that agility, flexibility and responsiveness to individuals is absolutely key. The best news is that emotional intelligence can be developed, unlike IQ, which is deemed to be near enough pre-destined from birth or even earlier. Raising our awareness to our behaviours, drivers and impact is the first step towards learning more flexible approaches to leadership. In most cases at Clearworks, we receive requests for executive coaching for leaders because they’re so successful and full of potential, not because there’s a problem. Individuals who are really travelling through their speciality at pace are the ones who will likely get the most from this sort of development. Sometimes something we have done all our lives suddenly stops working for us, or we feel the need to take the big step up. That’s where Executive Coaching for leaders can really make impact. A leader of integrity was stuck in his pursuit of the next big promotion. He was repeatedly being told that his opinions were always right and valued and he was highly regarded by everyone. Yet he repeatedly failed to secure that big new job and received feedback that he needed to “show more leadership” but he couldn’t grasp what that was, if he was smashing his role year on year and receiving such positive endorsement. Our EQ assessment tool of choice, EQ-i 2.0 revealed that he has a combination of very high “self-control” and very low “emotional expression”. Two of the measures on the scale which become interesting in combination. Turns out he kept all his emotion and passion under wraps. People didn’t know if he was in or if he was out, even though he felt everything very deeply. He did so very quietly. It wasn’t clear what he stood for in the fast-moving meetings. Sometimes physically demonstrating or expressing that we really care, will enable people to follow our leadership. Ice cool integrity, introverted energy and technical brilliance alone weren’t working for this guy as he planned to move up. Working with a coach to identify how he could flex his style while remaining true to himself, was part of his coaching programme. Breaking down his belief that being more extroverted and vocal in meetings was “marketing flannel” and exploring how to leverage an authentic leadership voice was key. He has now secured promotion into the leadership role he wanted. A talented female scientist who had had to push exceptionally hard to succeed in a male dominated organisation had pushed boundaries and rattled cages brilliantly to get herself into a senior leadership role. The first woman in the organisation’s history to do so. She said that from the moment she chose physics at A level she had felt marginalised, lonely and pressured by the lack of female peers. The fight she had conducted to get there had been highly successful but had left her tired and cross and despite the success, she was being described as ‘angry’ and ‘argumentative’ at the senior level by her peers and team members. This was the moment to look again and decide whether the future behaviours need to be the same or different to get her to where she wanted to get. How are these behaviours still serving you now?” is the key question. She completed an EQ 360 process to gather information from her manager, peers, team members and clients, and used that information to decide what to do. Raising one’s own self-awareness can be a painful process and raises challenging questions. But the key to this success is choice. The perception of others is not a truth. It is not right or wrong. It just is. Knowing how we land is exceptionally powerful in building leadership flexibility and agility. What would people say about you? What are the adjectives that would form around you? From your team? Your peers? Your manager? Your biggest advocates? The people you wind right up? All of that information is fuel in your leadership flex engine and offers you choices to make. If there’s a big gap between the groups of people, that’s worth knowing about too right? What’s the gap between the words they use and the ones you wish they’d use, if any? 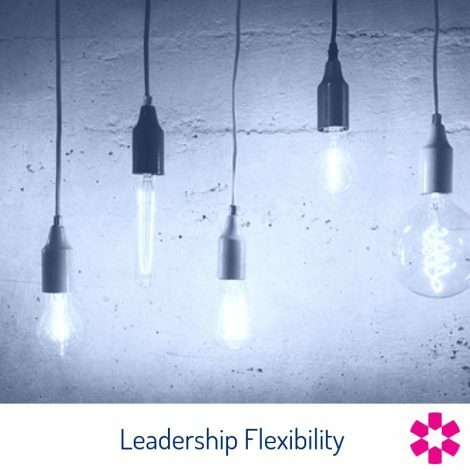 If you can find that gap, you know exactly where to start the work..
And if you’d like to understand that gap and get working on your leadership flexibility, we’d love to hear from you here. Or read more about us here. Aly King-Smith is Director of Clearworks and a new member of Silverstone Technology Cluster. Based in South Northants with a global client base, developing leaders in STEM, Biotech and Pharma.